It’s day four of 12 D ays of Gluten-Free Christmas Cookies. I hope you’ve been enjoying it so far. Were you waiting anxiously to find out exactly what my cookie was? It’s a peanut butter peck cookie, of course! A peck cookie? Huh? Well, traditionally, this would be a kiss cookie. But, sadly, Hershey’s kisses, even the dark chocolate ones, contain dairy. So, no more kisses for me. But, a peck is almost a kiss, right? I did two variations of this cookie. The first is the “fool the gluten eaters” version. It’s full of sugar and makes liberal use of grains. Mostly whole grain, but grain, none-the-less. That’s okay, I make allowances for holidays and special events. But you know what? I don’t really want to eat those kinds of things on a regular basis. So, I decided to make a grain-free, refined sugar-free batch, too. Just for me. I gave the other ones away. Which version will you make? Preheat oven to 375°. In a large bowl, beat the coconut oil and peanut butter until smooth and fluffy. Beat in the palm sugar, flax egg, vanilla, and milk. In a small bowl, combine the baking soda, salt, sorghum and arrowroot. Whisk well. Beat the dry ingredients into the wet ingredients. Shape dough into 1.5 inch balls. Roll the balls in sugar. Bake for 10 minutes. Do not over-bake! Remove from oven and immediately gently press a chocolate nonpareil onto the top of each cookie. The cookies will crack. That’s normal. Don’t press too hard or you’ll end up with crumblier cookies. Preheat oven to 375°. In a large bowl, blend the coconut oil, peanut butter, palm sugar, flax egg, and vanilla. In a small bowl combine the dry ingredients, whisking well. Beat the dry ingredients into the wet ingredients. Shape the dough into 1.5 inch balls. Roll the balls in palm sugar. Bake for about 10 minutes. Do not over-bake! Remove from the oven and immediately top each one with a homemade chocolate disc, pressing down gently. In the top of a double-boiler, melt the palm sugar and unsweetened chocolate. When fully melted, stir in the powdered stevia. Taste and add more stevia until it is as sweet as you like. (I left mine barely sweetened.) On a piece of parchment, spoon small circles of chocolate to make chocolate discs, or use commercial candy molds. (I made discs, molded Christmas trees, and molded rounds.) This batch makes enough for about 2 batches of peck cookies. And for more Holiday favorites, check out Gluten-Free Holidays at the W.H.O.L.E. Gang. This entry was posted in Blogger Community, chocolate, cookies, peanut butter and tagged 12 Days of Christmas Cookies, Christmas, cookie, holiday. Bookmark the permalink. Yay! Both versions look great and I love that you included two recipes! Smart. My 2YO was on my lap while I was looking at your great pics. She said, Can I have some Mommy? Looks like we’ll be making some! Thanks Deanna. I can’t wait to see your next cookie. think the grain-free version would be successful with an egg, rather than the flax? I think it would work with egg, yes. I’ve not tried it, but I would imagine that it would work. GORGEOUS pictures Deanna! My 3 year old is begging me to make these today and I just may have to crack, they look so yummy and I don’t need to do any tweaking (yea!). Thanks so much Heidi! Which version will you do? Thanks Kim! By all means, add the kisses to a few for those that can eat them. It’s what I would do, too! I love these photos! I feel like I could reach into the computer and grab a cookie right out! 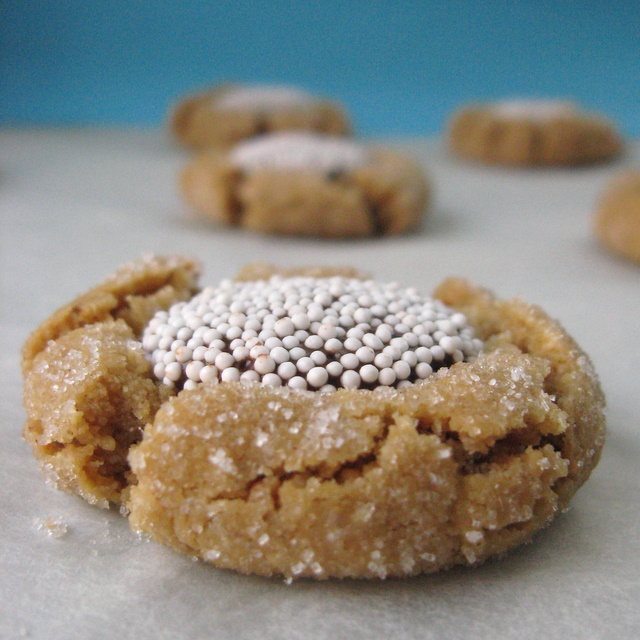 These look great, am making my cookie recipe list this weekend and want to make more healthier versions this year! Do you need the xanthan gum? What does it do and where can you buy it? Thanks! Xanthan gum is a binder that acts as a replacement for the gluten. These would definitely not work without either xanthan or guar gum. You could possibly get by if you used an egg instead of the flax “egg.” But, they’re not very sturdy, and the xanthan gum is what holds them together as much as they hold together. I buy it in my regular grocery store in the gluten-free section. It’s also available online. LOVIN’ these recipes!! Those peanut butter cookies are a must try. I LOVE that you healthified these cookies, I adore this kind. And I like your renaming of them. 🙂 I’d absolutely select your second version. I love the second version the most & your home made chocolate discs look amazing & wonderfully too! I woukd cove to make the grain free, non refined sugar version, but am allergic to tree nuts. Is there anynparticular flour you would recommend using as a substitute for almond flour? Wow – grain-free and tree nut free? That’s a tough one. I guess if you can do the non-grain, but grain-like flours – like buckwheat – that might work. It’s worth a shot anyway…. Oh, and you might be able to use peanut flour combined with a little more coconut flour. That _might_ work. Or, possibly a combo of gar-fava, coconut, and peanut flour Let me know if you try any of those combos. Pingback: 12 Days of Gluten-Free Christmas Cookies WINNERS! definitely the grain free version – the other one made my teeth ache just looking at it! How very accommodating of you to offer both kinds of treat at Christmas. 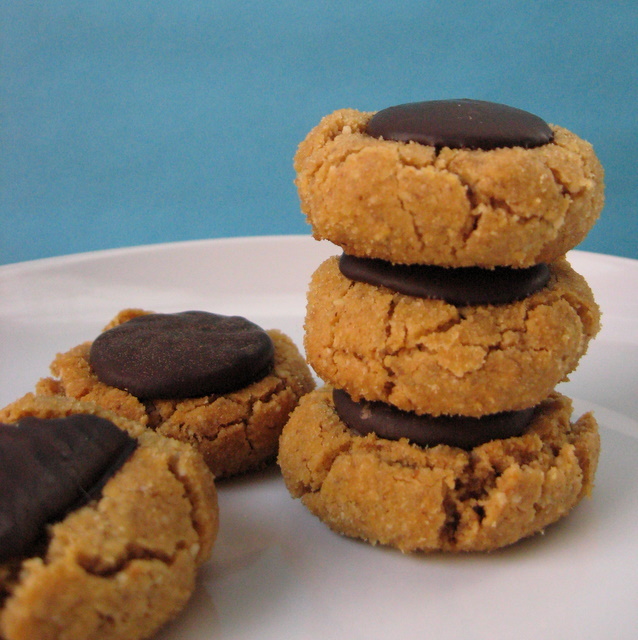 Peanut butter cookies are a kind of magic – add chocolate and there’s alchemy!